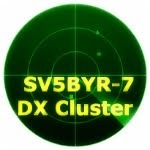 SV5BYR: 6m open to HA, OK, DL, OM, OE, I. Nice opening this time to 6m but after 30 qso I decide to move on 2m to ....rockin. Here is the opening map.